John Dean: But we’ve had a couple of calls on Social Security claiming options and why they’re important? Why are we talking about this? Well, number one Social Security is very important to many people. It’s the foundation of their retirement plan in many cases. But it also relates to your distribution strategy. 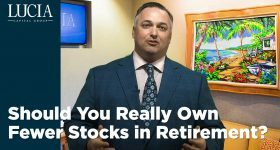 You’ve heard of this whole four percent rule which says you shouldn’t take more than four percent of your portfolio. And in some cases, some people have narrowed it down to somewhere in between two and three percent. 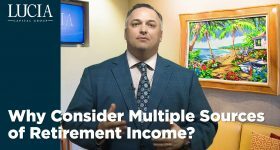 However, there may be a circumstance where you can take not just a little more than four percent but a lot more than four percent, and coordinate this with your Social Security strategy. So let’s go over this hypothetical scenario. Professor Plum: I was just playing with numbers. And let’s say we have a single individual who wants to retire at 64. They have $750,000 saved up, and they could take their Social Security at 64, and it would be $2,300 a month. So they’re looking and saying, “Well, I could take 2,300 a month that means I’ll need 2,700 a month from my portfolio.” 32,400 a year – That’s about a 4.4% distribution on the 750,000. Hey, that’s not bad. That’s probably a very doable goal. Now we look at the individual says yeah, but I have a pretty good life expectancy. But, what if this individual happens to have expected longevity? They believe they’re going to live a long time, so they want to wait to take their Social Security until age 70. If they waits, until 70 to take their Social Security, that will be 3,500 a month. So at that point, they wouldn’t need anywhere near as much from the portfolio. But in the meantime, for the next six years, they want a $5,000 a month gross income. That’s an eight percent distribution off of a $750,000 portfolio. Now you might say eight percent is unsustainable. And you know what? You’re right. It is unsustainable for a long period time. But they’re not trying to do it for a long period time. They’re trying to do it for the next six years. And then they’ll take a lot lower distribution from their portfolio. So does it work out in their favor; and what kinds of rates of return do they have to earn to make it work out in their favor? Well, we know that they want 60,000 a year for the next six years. You know there are online bank accounts that will let you earn one percent or a little bit over. So let’s take that $360,000, and put it in one of those accounts. Now we can take $5,000 a month for the next six years, taking that $350,000 off the table and out of the $750,000. Now you’ve got $400,000 left over that we can leave alone to grow for six years. We know we could get some rate of return. Now five years from now, when we start taking Social Security, we will only need $1,500 a month from our portfolio because we’ll be receiving a $3,500 benefit. So to have a four percent distribution six years from now, we need our portfolio to be at least $450,000. It’s at $400,000 today, and it needs to be at least 450,000 over the next six years to just have a four percent distribution. What do we have to earn on that $400,000? We have to earn 2.4% percent. And so I go from having a 4.4% distribution if I take my Social Security, to a potential four percent distribution if I can earn 2.5% on my portfolio over six years. So how much risk am I taking to delay taking my Social Security, assuming all the risks? It’s all a matter of what type of risk. We know we can put some money in a bank account if we had to, and make it work for the next six years. Now that we’re receiving our benefit, we need 18,000 a year from our portfolio. Let’s say we wanted to provide a time horizon of 15 years for anything that has volatility. So, of the 15 years, we can have about six in savings. 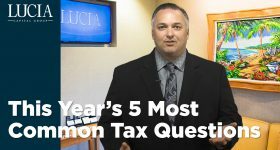 We could then take a $150,000 of the remaining $400,000 and put it into a guaranteed fixed annuity and let it grow for six years and turn that into another income stream for nine years. These incomes can potentially supplement our Social Security. That means we’ve got $250,000 that we’ve got at least the 15 year time horizon with, that we can earn – let’s say seven percent. Now we’ve got $700,000. And how much do we need to take from that $700,000? Whatever 18,000 plus inflation is. And we’re now 80 years old, and we only need a 2% or 3% distribution. We were able to reduce our distribution because of the strategy we employed. We first decide when we want to take Social Security. Then, we bucketize our portfolio around that decision. Which is why strategy can potentially make or break your retirement. Annuities are long-term investment products designed for retirement purposes. Guarantees are based on the claims-paying ability of the issuer subject to their terms and conditions. Early withdrawals may be subject to surrender penalties and, if taken prior to age 59½, may be subject to an additional 10% federal tax. Annuities are not FDIC insured. Certain terms and conditions apply, so please read insurance company materials carefully. 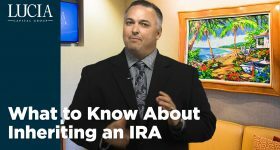 Rick Plum is a registered representatives of, and offer securities through, Lucia Securities, LLC, a registered broker/dealer, member FINRA/SIPC. Advisory services offered through Lucia Capital Group, a registered investment advisor, and an affiliate of Lucia Securities, LLC. Registration with the SEC does not imply a certain level of skill or training. John Dean is an associated person of Lucia Securities, LLC. The views and opinions expressed on this show do not necessarily reflect those of Lucia Capital Group or its affiliates.